Nick Spalding: OUT NOW! The brand new, extended edition of Love... From Both Sides! OUT NOW! 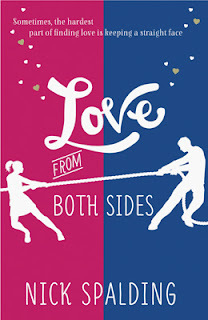 The brand new, extended edition of Love... From Both Sides! You can now buy the brand new, extended ebook edition of Love... From Both Sides at all good retailers! This new edition is published by Coronet Books - an imprint of Hodder & Stoughton - and features nearly twenty thousand extra words, four new chapters and extended sections throughout. All in all, it's almost a third again as long as the old version. More Jamie, more Laura, more laughs, more romance! ...but thankfully no more shitting into a pedal bin. Amazon, Waterstones, WH Smith and Foyles. When Nick Spalding self-published Love... From Both Sides and Love... And Sleepless Nights he became one of the bestselling ebook authors of 2012. Now for the first time the Love... books are being published in a longer format with more of the love story, more of Laura and Jamie's ups and downs and more of the laugh-out-loud hilarious moments that fans have come to know and love. Love... From Both Sides is a warts-and-all romantic comedy for everyone who knows how tricky the quest for love can be.